The seizure of a covert shipment of missile parts from Cuba on a North Korean freighter is raising new fears that the two communist governments secretly are engaged in the trade of threatening ballistic missiles. The North Korean ship seized Friday by Panamanian authorities included sophisticated Russian radar for SA-2 surface-to-air missiles and revealed for the first time military cooperation between Cuba and North Korea. A U.S. official said authorities in Panama were continuing to unload the contraband cargo as of Tuesday afternoon. So far it appears the illicit cargo is limited to surface-to-air missile components. According to photographs made public by the Panamanian government, one of the components photographed in the hold of the ship was identified as a vertical radar beam emitter for Russian SNR-74 tracking and guidance radar. The radar is used with SA-2 Guideline anti-aircraft missiles deployed by both communist governments in Cuba and North Korea. Richard Fisher, a military affairs specialist, said the seizure of the shipment should be a major concern for the United States. "North Korea, a country soon to be in a position to export nuclear warhead armed ballistic missiles, now has a missile relationship with Cuba," said Fisher, a senior fellow at the International Assessment and Strategy Center. "So in Latin America there is the prospect that North Korea, already a major missile technology partner for Iran, may become a competitor or partner for Iran in aiding the proliferation of missile and potentially nuclear weapons technology among the leftist, anti-American grouping of Latin state for which Cuba is a major leader," he said. Fisher said both Cuba and North Korea deploy SA-2s, missiles first developed in the early 1960s but in the last decade have been upgraded with modern computers, electronics, and optical sensors in China, Russia, and other countries. Fisher believes the shipment was part of a Cuban-North Korean military cooperation to upgrade each country’s SA-2s with advanced tracking electronics. "With such upgrades these heretofore obsolete SAMs have been given new hard-to-counter capabilities and the prospect of such upgrades going into the still substantial population of these SAMs began to concern the U.S. military over a decade ago," Fisher said. What remains unclear is whether the Russian missile radar was being sold to North Korea by the Cubans or whether the Cubans were shipping the radar to North Korea for maintenance or upgrading. The fact that the components were hidden shows that the missile goods are likely banned under U.N. sanctions. The United Nations Security Council has imposed sanctions on North Korea for its nuclear and missile tests. The sanctions prohibit the transfer of military and missile goods from any country to North Korea. Sharon Squassoni, director of the Proliferation Prevention Program at the Center for Strategic and International Studies, said there are many missing pieces to the case and truthful answers from either Cuba or North Korea are unlikely to surface. "But it certainly highlights the propensity for outlaw states to collaborate where they can," she said. "This shipment violates U.N. Security Council resolutions banning imports and exports of military goods to and from North Korea. It also highlights the need for continued vigilance in interdicting these kinds of illegal shipments." Panama’s President Ricardo Martinelli announced late Monday that the ship was suspected of carrying illegal drugs and was stopped by drug enforcement officials as it prepared to enter the Panama Canal after leaving port in Cuba. 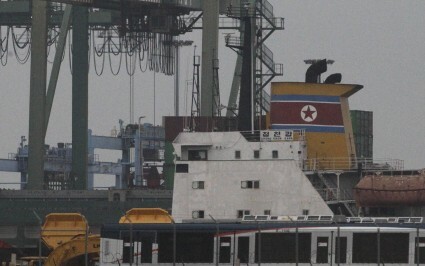 It was taken into port after a fight between Panamanian authorities and the North Korean crew. The North Korean ship captain attempted to commit suicide, according to wire service reports. Martinelli stated that the missile radar and components were found hidden in a shipment of sugar. "The world needs to sit up and take note: you cannot go around shipping undeclared weapons of war through the Panama Canal," Martinelli was quoted on Radio Panama as saying. The ship remains held in Panama and under the 102-nation Proliferation Security Initiative, to which Panama belongs as a member. The missile components could be confiscated. Martinelli said the ship’s captain "tried to commit suicide" and the crew rioted during the boarding operation off Panama coast near the Atlantic entrance to the canal. Panama's Security Minister Jose Raul Mulino also was quoted by the radio as saying the ship was confronted on Friday and the violent reactions from the captain and crew triggered suspicions about its cargo. Javier Caraballo, a Panamanian anti-drug official, said no drugs were found on the ship but instead "we found military equipment." A U.S. official said North Korean state-controlled media so far have made no public comment on the seizure of the ship, identified as the Chong Chon Gang, a 450-foot freighter not known to transit waters in the western hemisphere. A State Department cable from 2009 stated, "North Korea remains one of the world's leading suppliers of ballistic missiles and technology." North Korea supplied missile goods to Iran, Syria, Yemen, Burma, and other states, the cable said. The cable warned that "North Korea is probably also pursuing new markets for its missiles, including in regions such as Southeast Asia and Africa." "North Korea offers a wide-range of ballistic missile services, almost certainly is willing to offer any missile design in its inventory for sale to customers interested in complete systems, and can design missiles to meet specific customer needs," the cable said. "For customers with established missile programs or otherwise lacking interest in complete systems, North Korea provides missile refurbishment and technical expertise, ground support equipment and launchers, and production technology." North Korea also purchases missile goods that are too costly or advanced to make domestically, that cable said. They include missile component testing equipment, heat-resistant materials for re-entry vehicles, heavy-duty vehicle chassis, missile tracking technologies, precision machine tools, specialty steels and aluminums, ball bearings, precision gyroscopes, solid-propellant precursor chemicals, and liquid-propellant precursors. The current missile shipment also highlights Cuba’s past relationship with Russian missiles such as the missile deployments that triggered the 1962 Cuban missile crisis between the United States and Soviet Union. The crisis brought both countries to the brink of nuclear war. David S. Sullivan, a former staff member of the Senate Foreign Relations Committee with extensive military intelligence experience, said the North Korean shipment is probably a trans-shipment from Russia to North Korea, with a stop in Cuba for sugar. "It could also be a Russian or Russian-Chinese proliferation channel that was uncovered," Sullivan said. Sullivan said U.S. intelligence was never able to completely verify after the Cuban missile crisis whether Moscow removed all of the SS-4 medium-range missiles, SS-5 intermediate-range missiles, nuclear-armed Frog missiles, and nuclear-capable IL-28 bombers, all of which were deployed to Cuba by 1962. The United States was unable to verify the removal of the missiles and warheads despite a United Nations resolution permitting on-site inspection. Several Soviet ships were boarded to check on missile removal. "We were never able to verify the removal of a single nuclear warhead, however—only some of the missiles," Sullivan said in an email. "Over the years in the later 1960s, 1970s, and 1980s, there were continuous reports of strange activities in Cuban caves, of which there were many— for biological weapons and chemical weapons storage, and nuclear weapons storage." The submarine support base at Cienfuegos was used by Moscow to dock visiting ballistic missile submarines and "there was even a probable nuclear warhead handling facility there," he said. Fisher suggested that China is behind missile proliferation in the Western Hemisphere as part of its program for the United States to become embroiled in confrontations in Latin America. "It is also important to consider that North Korea and Iran have reached the precipice of nuclear missile state status due to the consistent support, both indirect and occasionally direct, from China," Fisher said. "Such conflicts [in Latin America] first and foremost will divert U.S. military attention away from Asia, but will ensure enduring popular antagonisms between the United States and Latin states which China intends to exploit fully." William C. Triplett, II, former chief Republican counsel on the Senate Foreign Relations Committee, said Panama performed a significant service by uncovering one leg of North Korea's vast arms smuggling programs. "It doesn't seem likely that North Korea would have wanted such an antiquated system for itself given the level of sophistication of opposing air forces from the Republic of Korea, Japan, and the United States," he said. "It seems more likely that North Korea, like Havana, was just another middle man in the global arms smuggling operations." Triplett said it has long been know that Pyongyang and Beijing are active on the arms black market. "Now we know that Havana is one as well," he said.